Steeped in depression, entrepreneur Teddy Whitaker hops aboard a freight train through the Ozark Mountains to escape his past and his problems. 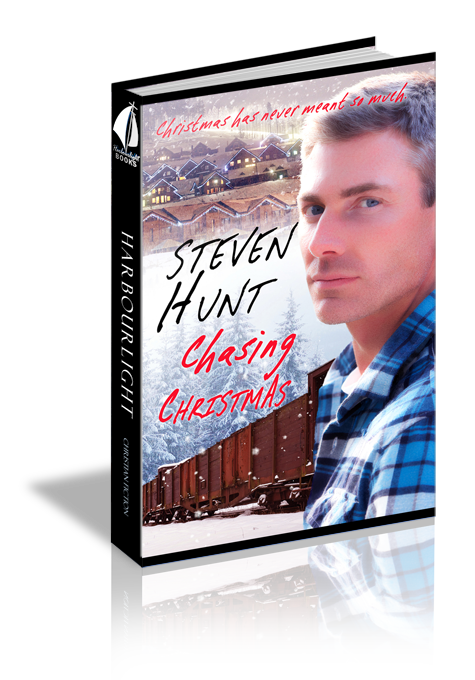 Startled by a mysterious stranger who appears to him in a boxcar, Teddy discovers that in order to defeat the darkness and reclaim his life he must learn three lessons before Christmas morning. If he succeeds, he will become a new man. If he fails, he will lose his life. Yet, deep in the thick woods of Missouri stalks a certain evil; an evil determined for Teddy to fail. Teddy glanced into the rearview mirror, not recognizing the person that stared back. Gone was the snappy and confident man he’d seen every morning for forty-eight years. The eyes that looked at him now were red-lined and sunken with blackish, puffy bags underneath, lifeless and empty. If the eyes were the gateway to the soul, his had disappeared. The headlights bore through the dim evening, illuminating the treacherous Missouri mountain road; a road that had claimed its share of lives over the years. As the speedometer’s needle quivered just short of eighty, Teddy Whitaker gripped the leather-wrapped steering wheel with white knuckles. The extra-wide tires on the 1967 Chevy Camaro—his dream car—squealed in protest around each sharp curve, emitting a pungent smell of burnt rubber amidst a trail of gray smoke. His right foot stomped on the accelerator, fueled by an overabundance of confusion and loneliness. Replaying the tragic events of the past months, he accelerated toward what the locals called Dead Man’s Curve. Depression, they called it. He smirked at the thought. He could be the spokesperson for a national depression association. He’d never been this depressed before. This evil proved a worthy adversary: controlling and powerful. He was tired—physically, emotionally, and mentally. Exhausted from fighting the unending negative thoughts swirling in his head, weary of being the target of sympathy stares, and bored of being told he needed help. Drained and depleted, he was tired of living. He inhaled a deep breath before releasing it slowly to settle the anguish in his stomach as he jammed the accelerator harder to the floor—as if he could get more power out of the already flattened pedal—aiming the car straight for the apex of the curve. Every horse in the V8 power plant roared, unbridled; emitting a deep rumbling sound from under the hood. He dropped his hands from the steering wheel. Whether the car careened off the mountain at his chosen location or somewhere else, the result would be the same. Death. He dropped his chin to his chest, clamping his eyes closed. A song from his youth—when life contained less turmoil—blared from the radio’s speakers, drowning out the sound of the cold, north wind as he barreled along the road. He’d never envisioned during those long, tedious hours of restoring this car that it would serve to be his last resting place, his coffin for eternity. As he prepared for the weightlessness that would follow once he careened over the cliff, a surge of unexpected wind whipped through the car’s interior, ripping the ball cap from his head. The blast rippled his clothes and tossed his now uncontained hair. What happened? What had caused the gust of wind? The windows were tightly rolled to the top. The doors were closed. Nothing could explain the gusts of wind inside the enclosed vehicle. Could a window have blown out? Maybe slipped its track? He’d never driven this fast and reckless, so he didn’t know what to expect. Yet, he didn’t dare open his eyes to investigate. That would entail watching the car soar over the cliff and, from what he’d read, his instincts to survive would kick in, ending his attempt to find that elusive peace. As the Camaro veered sharply to the left, a second powerful force gripped the front of his coat, crushing his chest. The Herculean force yanked and pried at his seat-belted body similar to the force a child would use while tugging an oversized rag doll through a jungle gym. Could it be he was having a heart attack? He’d read people often felt a pain in their chest similar to a crushing weight at the onset of an attack. No, that was impossible. He was too young. Wasn’t he? Teddy gritted his teeth as he pressed even harder on the accelerator. Whether heart attack or car collision he would find peace. A force grappled with his coat like an F5 tornado before a sudden sensation of weightlessness overcame him. Bitter air engulfed him, wrapping its freezing arms around him while biting into his flesh. The sound of the engine droned on. The familiar hum of the Camaro’s tires as they raced over the pavement quieted as the car plunged over the edge. Question 1: Instead of running from his problems what should have Teddy done? Answer 1: Discuss his concerns with Jane and turn over the problems to the Lord. Question 2: When Jack made a romantic pass at Jane, what should she have done? Answer 2: She handled it in the best manner by walking away and telling Teddy. Question 3: What does the cloak symbolize? The fog? Answer 3: The cloak is a metaphor for the restricted, sinking feeling of depression. The fog is a metaphor for confusion brought on by depression. Question 4: Ezi showed Teddy a field where deer, birds, and bear came to eat and play. What was Ezi trying to teach Teddy? Answer 4: That simple faith is a strong power and that the amount to fill a mustard seed was small. Question 5: What did Yebo do to sacrifice herself for the homeless? Answer 5: She turned away from the possibility of returning to the life of the houses. Question 6: What method did Love use to teach Teddy? Was this an effective method? Answer 6: Love directed the discussions to plant a seed in Teddy's heart so he could discover love within himself. While this method is not suitable for everyone, it was the best method for Teddy. Question 7: What is the best solution for someone who is suffering from depression? Answer 7: Seek treatment from a licensed professional. Having faith in God helps the depressed cope with the feelings. Seek help sooner rather than later because depression is a disease that increases over time.